I recently won a box of yummy meat from Jimmy’s Farm in a Twitter competition – you’ve got to love the power of tweets. As luck would have it we were holidaying in Essex this month so it was the perfect opportunity to visit the place where our goodies had been produced. Jimmy Doherty rose to fame after an appearance on a TV show with his childhood friend Jamie Oliver – you know, the naked chef guy. The rest, as they say, is history. Jimmy is now a rare breeds farmer and has presented numerous programmes himself. 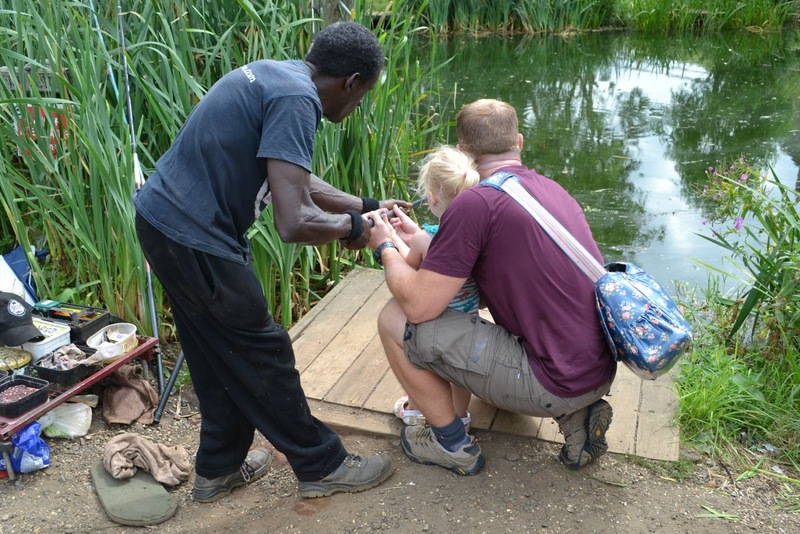 If you’ve followed the shows, the Jimmy’s Farm you see on your telly box is the one you visit, with a lot of extras that make it a great family day out. 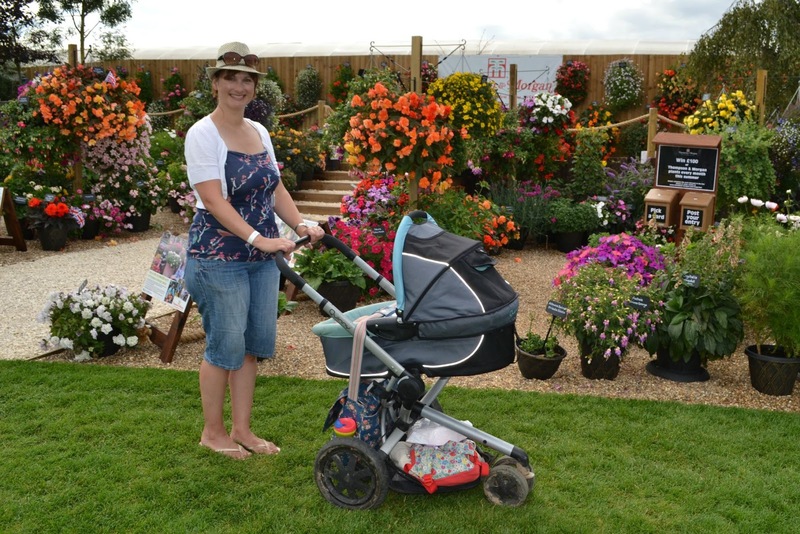 It is made up of 100 acres including the farm park, a woodland walk, an award-winning restaurant and farm shop. The whole place echoes of Jimmy’s fun character, and passion for farming and nature. The Tot’s favourite part was the huge bouncy pillow at the play area. We sat down in some shade nearby and watched her jump around manically with the other children for ages. 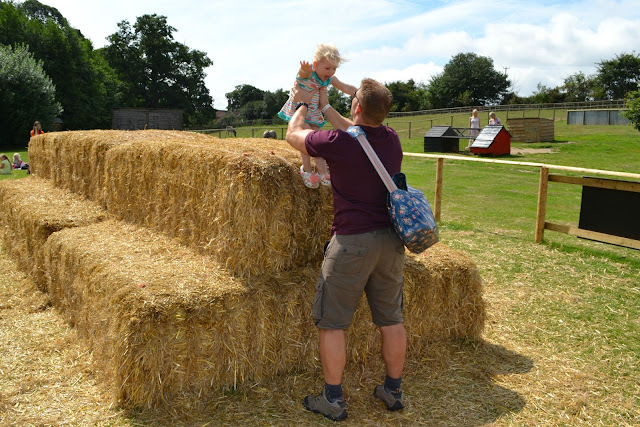 There’s also a huge sandpit, wooden play ground, a stack of hay bales and adventure play ground for older children. Tin Box Tot also liked hiding inside the Hobbit House. Something the really sets the day a part from other farms you might visit is fishing with Dolly who also featured in the TV series. I loved watching Tin Box Tot catch her first fish with Dolly. He was able to hook one every 30 seconds, much to the parents’ delight and the children’s bewilderment. 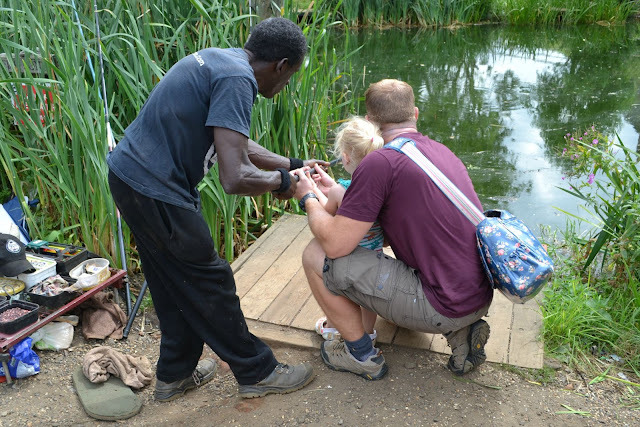 Fishing with Dolly is on during most school holidays and some weekends during the summer. The Tot is getting the hang of feeding farm animals and doesn’t back off quite as much as she use to. You can pet most of the animals on the farm and the are lots of hand washing stations about. 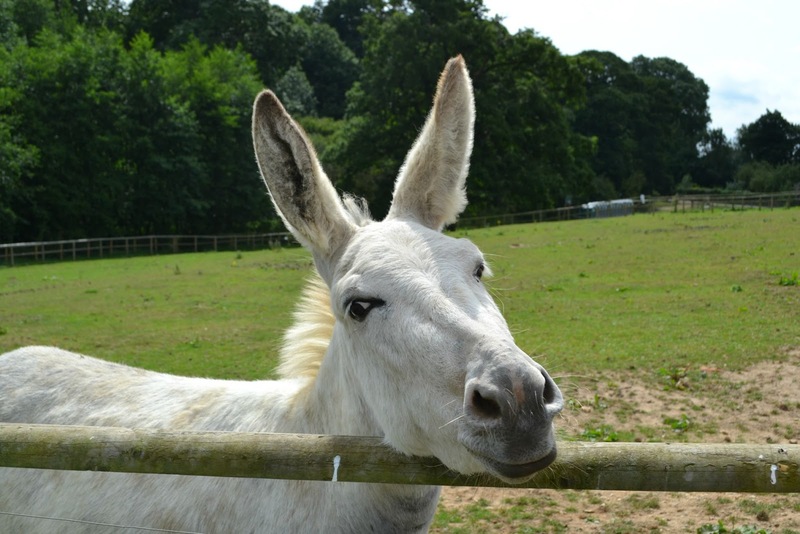 Resident on the farm are alpacas, reindeer, sheep, donkeys, guinea pigs, goats and cattle. Mr Tin Box’s favourite bit was making a den on the woodland walk. There’s loads of building materials and dozens of dens already made if you just want to play hide and seek. 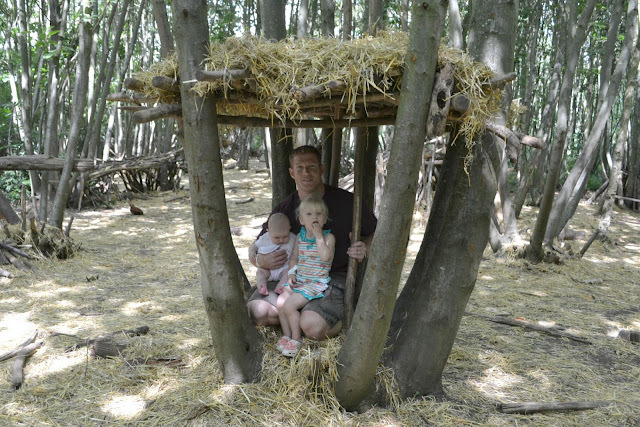 We spent at least half an hour there creating a canopy out of wood and straw. I think Mr TB would have been happy to stay longer and make something to rival some of the huge constructions left after the Sausage and Beer Festival a few weeks before. I loved the butterfly enclosure, which is full of exotic species. Unfortunately I wasn’t quick enough to get any good pictures. TBT didn’t like the butterflies fluttering around her head but they seemed drawn to her colourful dress. 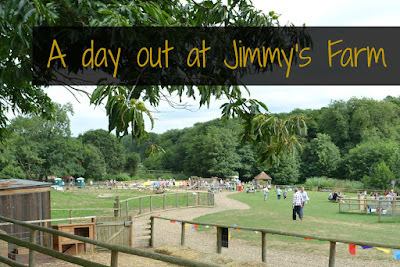 We ate a late lunch at Jimmy’s Field Kitchen, which is outside the farm park. We had a couple of Essex Rolls, which were sausages in a bun, and the Tot had a sausage roll and chips which was enormous for £4. We all helped to eat that and there was still a lot left over. If you fancy taking some of Jimmy’s produce home you can visit the farm shop. Mr Tin Box popped in to the butchery while I got the kids in the car. He came away with sausage and burgers for our barbecue. 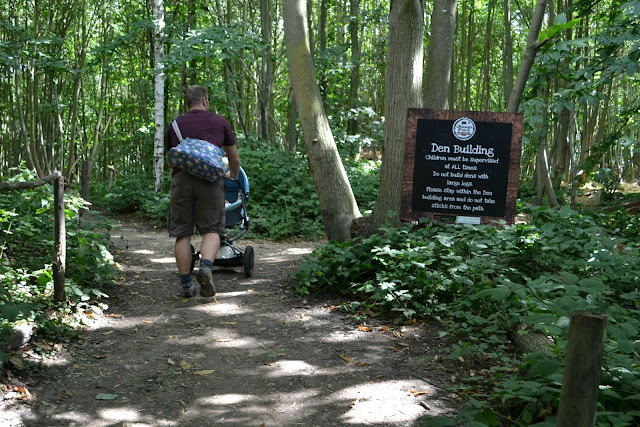 We were able to push Tin Box Baby’s pram all around the farm, although some extra muscle was need to reach the den building in the hilly woodland area. 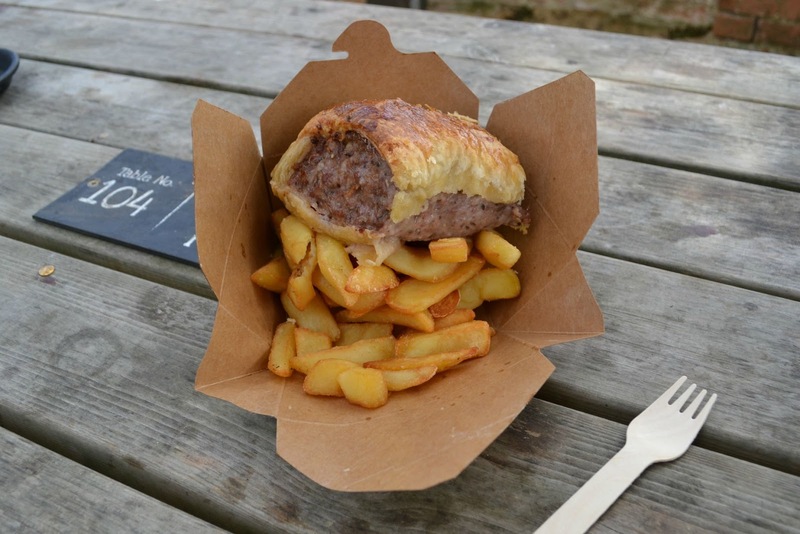 You can buy drinks from a gorgeous camper van inside the farm but you’ll have to pop back out to the Field Kitchen or Restaurant if you want something to eat. Lots of people had brought picnics and there was acres of space around the play area to throw down a blanket. 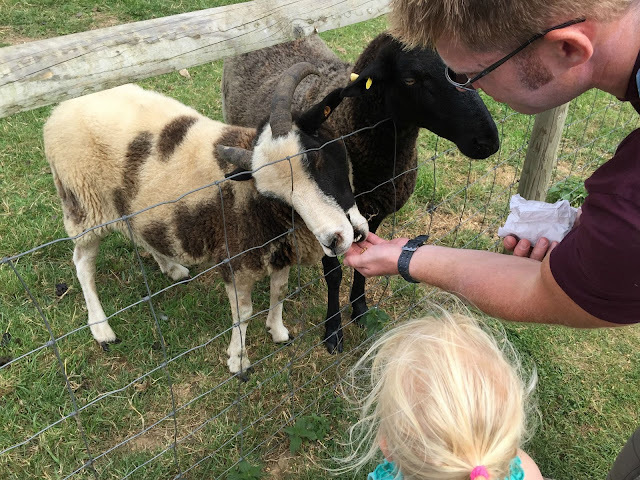 There’s plenty of places to wash your hands after you feed or petted the animals, which is really important to keep cross infection down at a farm. Be prepared for festival style loo breaks. There’s port-a-loos all around the farm and in the car park, and proper loos near the shops and restaurant. I have to say that the port-a-loos were immaculate. We didn’t realise until we were in the farm that we could have brought Tin Box Dog along. Dogs are welcome on a lead as long as their owners pick up after them. 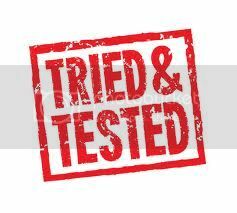 We had missed the Beer and Sausage Festival by a couple of weeks but would like to come back another year as it sounds fab. 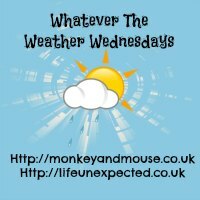 This year there were performances by Athlete, Toploader and The Shires. For the kids there was Justin Fletcher – the chap behind Mr Tumble (sorry if I’m shattering anyone’s dreams) and Mr Bloom. We’d love to go next year! The farm is open seven days a week. 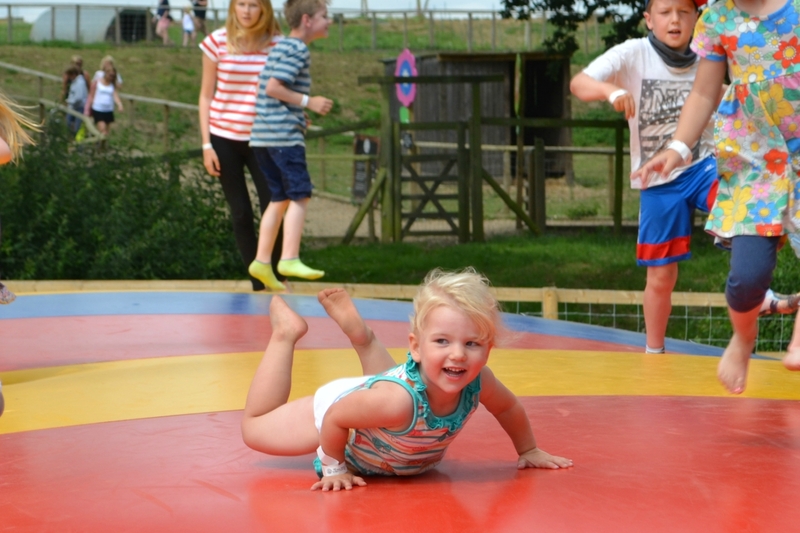 During the summer, entrance to the farm costs £4.50 per adult and £3.50 for children over two. 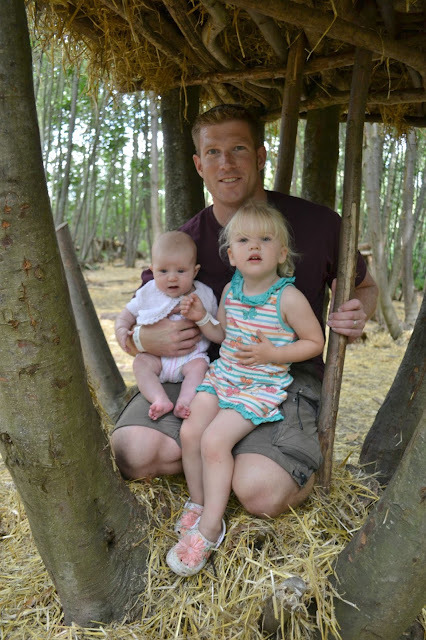 A family pass for two adults and two children costs £15. In the winter months prices are reduced. See the Jimmy’s Farm website for full details of dates and prices. After our late lunch we looked around the gardens which you can see without paying to go into the farm park. 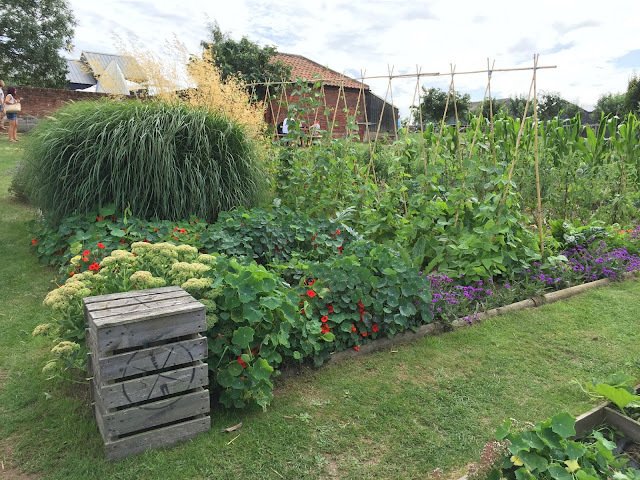 There’s also an impressive vegtable garden, farm shop and retail outlets to look around. Have you been to Jimmy’s Farm? Looks a lot of fun – I had heard of Jimmy's farm but not realised you could visit or that there was so much to do. I have to admit that I was expecting a few animals and that would be it. I was really impressed at the variety of activities. What a fun family day out, looks like there was heaps to do! Looks like so much fun! I love bouncy pillows, they have them at the Big Sheep too! I went to Jimmy's Farm a couple of years ago and it was a fantastic day out. I went to see the rare pigs and have lunch and hadn't realised there was so much family focused stuff there too. It looks like you had such a great time….What a fab day out! I didn't know you could actually visit Jimmy's Farm – how cool is that! It looks fabulous. Ooh, I watched of the early Jimmy's farm programmes, it looks like a great place to visit and so much to see! 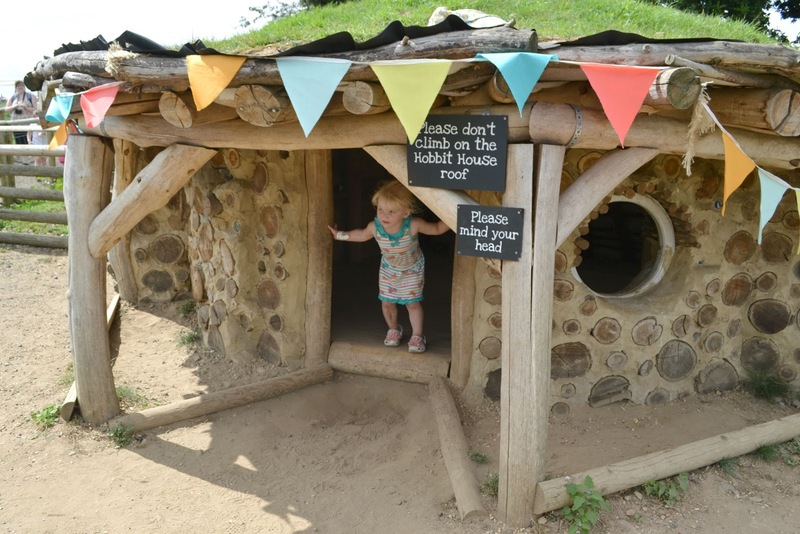 I love the hobbit house, it looks so cute and of course seeing all the animals is fun for all kids. What lovely memories you've made and beautiful photographs to remember the day. There was. I'd really recommend going if you're in the area! They have mum meet ups there too. I'd love to go regularly if we lived closer. I agree, the price was really good considering all the things there were to do inside. It was amazing and really good value! It was such good fun. Thank you! 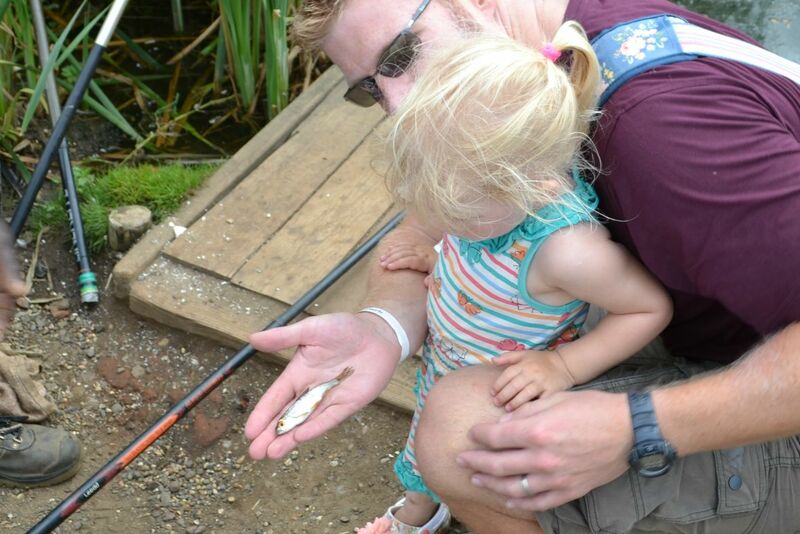 The fishing, dens and food we're definitely highlights for me. Dolly was amazing! 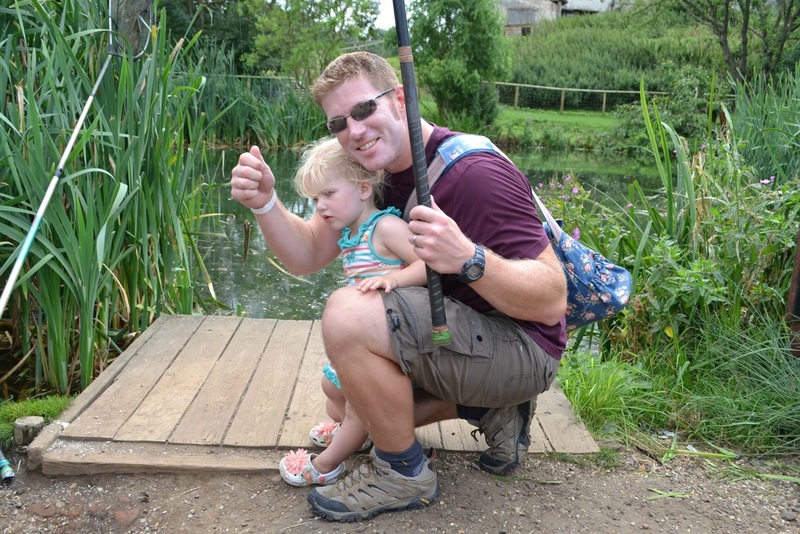 What a fab place to explore, it's great that it feels different to all the other farm parks out there. I bet the food was really delicious, homegrown food is always so much nicer! Bouncy Pillows seem to be everyone's favourite thing now, when my lot were little they weren't really around. Thanks for linking up with me on Country Kids. Oh this looks like so much fun! I feel a bit left out though, haven't heard of the "naked chef" #countrykids.